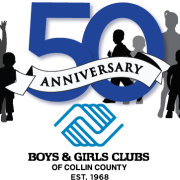 The Boys & Girls Clubs of Collin County (BGCCC) actively influences the lives of more than 3,800 children each year, making the community a better, safer and more productive place for all citizens. Five locations in McKinney, Frisco and Plano provide a variety of programs designed to promote education, healthy lifestyles, career and social skills, improving the lives of thousands of local children and their families. The BGCCC provides daily mentorship from caring, qualified adults after school and during the summer. As a 501(c)(3) nonprofit organization, the BGCCC has changed the lives of children and teenagers of Collin County for the better since 1968. The BGCCC shapes the outlook of individual children by providing a safe place to learn and grow when they are at their most vulnerable - in the hours between school and home, and during the summer. The BGCCC is committed to guiding children in a comprehensive manner, offering dedicated facilities run by professionals that feature unique programs for the development of character and leadership, education and career skills, health and life skills, the arts, sports fitness and recreation. The BGCCC is the only agency in Collin County offering prevention-focused developmental programs in an affordable, safe and nurturing environment. When you donate your time or other resources to the Boys & Girls Clubs of Collin County, you are directly helping to transform the lives of these children. Would you recommend Boys & Girls Clubs of Collin County?